The human rights group condemned the US State Department for issuing successive arms export licenses for the purpose of shipping crowd control munitions to Egypt. These shipments were approved in the middle of violent repression of demonstrators fighting for the ouster of US-backed dictator Hosni Mubarak and, subsequently, during protests calling for an end to rule by his successors in the Supreme Council of the Armed Forces (SCAF). The latest of these shipments arrived at the port of Adabiya, near Suez, on November 26, just a day after millions of Egyptian workers and youth took to the streets demanding an end to the SCAF military junta. Over the course of the previous week, security forces had carried out a bloody crackdown, killing at least 40 people and wounding thousands. In a number of cases demonstrators were killed with live ammunition, while in others, so-called “less-lethal” weapons were used in such a way, such as firing tear gas canisters at head level and close range, as to take lives. The November 26 shipment, according to Amnesty, included at least seven tons of “ammunition smoke,” which includes tear gas and other riot control munitions. The repressive materials came from Combined Systems, Inc. (CSI) in Jamestown, Pennsylvania, which, in addition to CS tear gas grenades, markets numerous other “less-lethal” munitions ranging from rubber baton rounds to flash-bang grenades and pepper spray. The human rights group reported that the shipment was organized by the defense logistics company Nico Shipping, with the munitions loaded onto a Danish ship, the Marianne Danica, at the US Military Ocean Terminal in Sunny Point, North Carolina on October 13. It also cited two previous shipments. On April 8, Combined Systems, Inc. shipped 21 tons of repressive gear from the port of Wilmington, Delaware to Suez. And on August 8, it sent another 17.9 tons of ammunition from the port of New York to Port Said in Egypt. The two shipments were listed under the product code of bullets, cartridges and shells, with the additional description of “ammunition smoke,” which includes tear gas and other chemical agents used for crowd control. In response to questions about the Amnesty report, State Department spokesman Mark Toner dismissed evidence that so-called “less-lethal” munitions supplied by the US were used to kill protesters as “anecdotal.” “We haven’t seen any real concrete proof that the Egyptian authorities were misusing tear gas,” he said. The State Department spokesman also defended the shipments by asserting that the kind of tear gas sent to Egypt “is used by police forces in many countries around the world including our own.” Indeed, the Egyptian regime has itself pointed to the brutal crackdown on the Occupy Wall Street demonstrations—in which an Iraq war veteran in Oakland, California suffered near-fatal injuries when a tear gas canister broke his skull—to justify its own repression. In the course of the lethal repression in Egypt last month, as dozens of unarmed demonstrators were being murdered in the streets of Cairo and other Egyptian cities, the White House issued a statement urging “restraint on all sides,” effectively placing equal blame on those killed and their military and police killers. 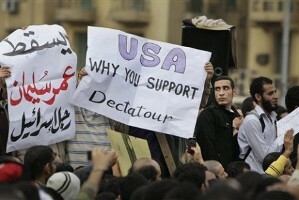 Whatever the words mouthed in Washington, however, Field Marshal Hussein Tantawi and his fellow generals in the ruling junta were well aware that the Obama administration was continuing to resupply their repressive apparatus—38 tons worth of munitions in just seven months—and remained committed to providing the same $1.3 billion worth of military aid that had gone to Mubarak when he was still in power. All of its rhetoric about supporting democracy and embracing the “Arab Spring” notwithstanding, the US government is determined to uphold the power of the military, which has been the backbone of the capitalist state in Egypt. It has served as the principal defender of the profit interests of the native elite—of which its top brass forms a substantial element—and transnational banks and corporations, as well as the guarantor of American strategic interests in the region, centered on Egypt’s treaty with Israel. The Obama White House and the State Department have continued to voice support for the SCAF-led “democratic transition,” even as the military repeatedly makes it clear it is not prepared to cede power. Thus Washington praised the military’s appointment Wednesday of a new “interim government” headed by Prime Minister Kamal El-Ganzouri, who previously served as a prime minister under Mubarak. SCAF’s head, Field Marshal Tantawi, claimed that this puppet body would have full executive power, with the exception of issues related to the military and the judiciary, thus leaving the full repressive powers of the state—along with the vast economic holdings accumulated by the military—in the hands of the armed forces command. The new cabinet is packed with former Mubarak officials and is drawn virtually exclusively from the ranks of his National Democratic Party, which was supposedly dissolved after his ouster. Ahram Online provided profiles of those named to the cabinet. Among them was Mohamed Youssef Ibrahim, a career police official under Mubarak, as minister of interior. He is best known for leading the violent repression of a 2005 demonstration of Sudanese refugees in which 27 refugees were killed and hundreds injured. The bloody incident became known as the “Mostafa Mahmoud massacre” after the square in Cairo where it took place. Adel Abdel Hamid, a 40-year prosecutor and judge tapped by Mubarak to head the Egyptian Court of Appeals, was named as minister of justice. Gamal El-Arabi, a 35-year functionary in the regime’s education ministry was named minister of education. Egypt’s Independent Union of Teachers charged him with corruption and vowed to hold mass demonstrations to prevent him from entering the ministry. Named minister of finance was Momtaz El-Said, formerly deputy to Mubarak’s finance minister Youssef Boutros-Ghali; the latter fled the country after the revolutionary upheavals last January to escape a corruption indictment. El-Ganzouri and his cabinet have been thus far unable to enter the cabinet building on Cairo’s Kasr Al-Aini Street because of an ongoing sit-in there by protesters demanding an end to military rule. There is no doubt that the regime is preparing to once again employ the vast quantities of “less-lethal” munitions—along with live ammo—that Washington has poured into the country.